It was a chaotic season for the Stanford women’s squash team from start to finish, but the Cardinal still managed to come home with the Kurtz Cup as winners of Division B of the 2015 College Squash Association Championship. Stanford, seeded second in its eight-team bracket behind only Dartmouth, strung together victories against Drexel and Brown before ultimately taking down Dartmouth in the championship. The 6-3 win in the final was a particularly big accomplishment given that the Cardinal lost a 7-2 match against the Big Green earlier this year. The team rode to victory on the strength of their biggest weapons. Sophomore CC Ho and freshmen Sarah Bell and Christie Huchro the Nos. 1, 2 and 3 on the team respectively, all went 3-0 in the tournament, setting the tone for the whole team and anchoring a spectacular effort. Senior captain Ally Huchro, who played as No. 4 in the tournament, had nothing but positive things to say about the overwhelming performance from the trifecta. The prevalence of youth has been a storyline for the Cardinal all season long. Of the nine players who represented Stanford at nationals, three were freshmen and two were sophomores. Three of the five underclassmen went 3-0, while the other two went 2-1, a testament to how strong the youth on this team really is. A strong core of young players is only one of the ways in which the squash team proves to be a major threat in the coming years. The team has battled injuries all year, most notably to sophomore Bailey Bondy. Bondy would have figured to play somewhere in the top three for Stanford had she not been out this entire year with an injury. As great as the championship win was for the Cardinal, Huchro conceded that it was a bit of a double-edged sword. A tumultuous season for the Cardinal landed them with a 4-9 overall record, which evidently wasn’t good enough to get them placed in the highest division alongside national powers such as Harvard, Penn and Trinity, all of whom decisively beat the Card this year. “Being in the second division was initially a little disappointing,” Ally Huchro said. “But with that disappointment, coming back and winning that championship really decisively basically proved to ourselves and to all the other teams out there that we did deserve to be in the top division. With the conclusion of nationals, Stanford now transitions to the offseason, where Huchro maintains that the team won’t slack off despite the breathing room. 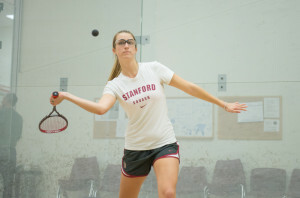 With the Kurtz Cup on the mantle after a rocky year, the Stanford squash team will look to maintain its form and hopefully find its way to the A Division next year, as it hopes to make some noise with a strong contingent of talent, both young and old. Contact Sandip Srinivas at sandips ‘at’ stanford.edu.